Should I Have A Photo? No Photo On Medical Professional CV. In my years I have reviewed tens of thousands of both doctor CVs as well as many other types of CVs and Resumes. I've gotten quite good at reviewing them quickly and determining who is and who isn't a good prospect for a role. A question I get asked a lot by other medical practitioners, particularly medical students and trainee doctors, about their CV is “Should I put a photograph on my CV?”. There are 3 main reasons why you should not put a photograph on your CV. 1. A photograph on a professional CV can be seen as pretentious 2. A photograph on a CV provides an opportunity for the reviewer to infer biases about you simply based upon your opinion. 3. A photograph on your CV distracts the reviewer from other important information. There is also only one good reason why you should put a photo on your CV in my opinion. The Only Reason You Should Put A Photograph On Your CV. Let's start with the reason why you should. It may seem fairly obvious. But there are some situations where the employer specifically requests a photograph on your CV. So if that is the case then you should obviously oblige. Ok Now. What about the reasons why you should not put a photograph on your CV? Well the first reason is that Medicine is a conservative profession and if you ask interview panel members most will tell you that they feel that a photograph is a negative. Its just not what is expected and therefore too novel. The second is that the presence of a photograph can introduce the opportunity for biases to occur just based upon your appearance, which is less likely to occur when there is plain text on the page. And the final reason is that a photograph is likely to distract the reviewer from reviewing the other details of your CV. Which is quite crucial once you know how long it actually takes someone to review your CV the first time! So my advice to doctors is to not put a photograph on their CV. There are too many possible minuses versus pluses to be gained. So you may be wondering now. Why photos can distract or introduce biases. As well as possibly whether the situation might ever change in relation to photographs on your CV. It is well established in psychology that one way that our attributions may be biased is that we are often too quick to attribute the behaviour of other people to something personal about them rather than to something about their situation. This is a classic example of the general human tendency of underestimating how important the social situation really is in determining behaviour. When we tend to overestimate the role of person factors and overlook the impact of situations, we are making a mistake that social psychologists have termed the fundamental attribution error. One of the best text-book examples of this integrates stereotyping: Imagine two doctor CVs both are exactly the same in terms of the training and experience they have had. One CV includes a photograph of a young looking female doctor. The other male doctor does not include a photo. Both doctors are both the same age. Which of the two doctors are the panel likely to stereotype as being “too inexperienced for the role”? How long is spent looking at a CV? The Ladders Survey is well known and well cited in the HR profession. In this survey the Ladders recruitment agency brought in a number of professional recruiters and recorded their actions as they reviewed candidate profiles online. The results were stunning. On average seasoned recruiters were only taking 6 seconds to review a candidate's resume and make a determination if they should be further considered. When a candidate did add a photograph to their CV. Looking at this took up 20% of that valuable average 6-second time. Pretty much everyone cites the Ladders Survey and the 6 second rule. And whilst we can debate whether its 6 seconds or perhaps a few more seconds. Lets say 8 seconds. If you talk to any doctor who is involved in mass candidate recruitment activities, such as annual medical recruitment. They will rapidly tell you that they have CV review honed to a fine art. By the way one thing that most people have forgotten about the Ladders Survey is that they also found that professionally written CVs were seen to be 60% easier to read. Update Feb 2019. Unfortunately the link to the 2012 report has been taken down. 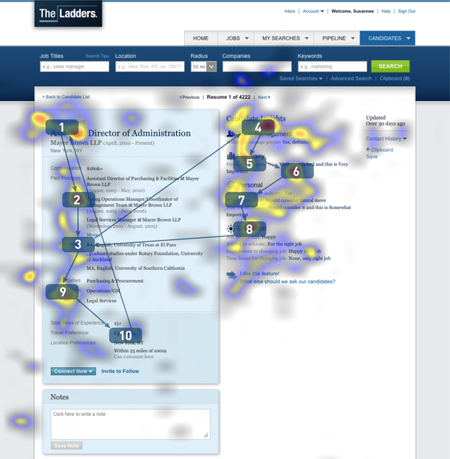 Ladders updated its eye-tracking report and reports that the average time for review has gone up slightly to 7.4 seconds. So if its only taking the JMO Manager or Director of Training 6 to 8 seconds to look at your CV and decide your interview fate. Why would you want to risk it on a photograph if you don't have to? Far better to focus your efforts on making your front page stand out in other better ways as we have written about in the past. Probably. And I'm predicting in not too short of a time. A couple of things to look out for here are the fact that the technology for recruitment is advancing into a number of new spaces, including video resumes. Which means that at a certain point a photo on a CV will look more old fashioned than too new. The second thing is that it is now possible through google and social media to relatively easily find a photograph of a person who has applied for a job if you as the recruiter really want to. And in time I would expect that recruitment applications like many other applications become very good at finding the avatar photo that is linked to your email address and automatically incorporate it into your application. Scary huh? Do I need to worry about having photos on my LinkedIn profiles and other social media profiles? The Answer to this question is no. How odd does it look when you find a colleague on LinkedIn and they don't have a picture? Its expected (a social norm) on LinkedIn. As we have discussed above. Its likely that in a not too distant future that we won't be talking about whether we should be putting photos on CVs. We will be talking about whether we should have a video resume or not. Are there other things I should avoid putting on my medical CV? Yes actually. There are several. Chief amongst these is probably unprofessional email addresses. You know the one you made up in highschool on gmail because it was funny. Its always best to strive for a professional sounding email. A gmail is ok if it contains you name and not too many extra numbers and underscores. If you want to up the ante a bit. You can invest in a personal domain name for a few dollars and set up your own branded email address and run this yourself or through Google. Some other things you should avoid putting on your medical CV are your date of birth (similar reason to the photo) and unrelated hobbies. What are the important things to have on my medical CV? For that particular question we have written you an entire post that covers it.